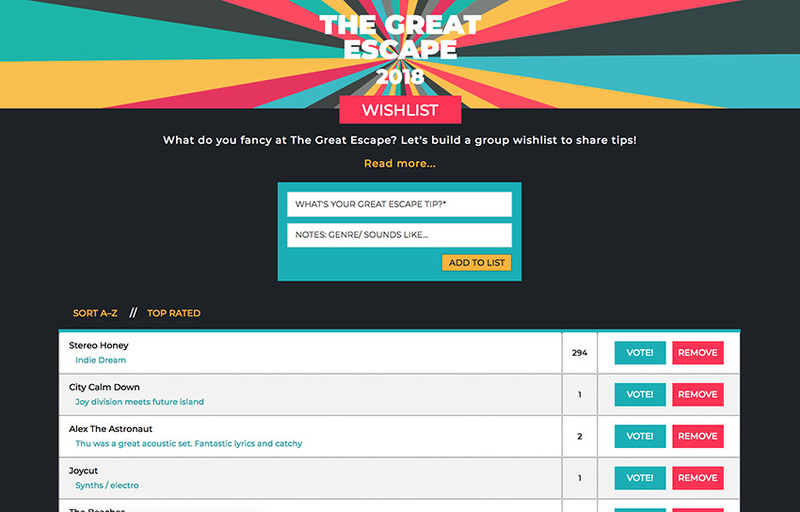 As a keen music fan, I go to The Great Escape festival every year and share ‘who-to-see’ tips with friends through text, WhatsApp, Facebook… but I wanted to store this growing list in one place, where anyone with the URL could view and interact with it. Built on Glitch, the ‘wishlist’ is a simple Node.js app with SQLite database. From the start this had to work on mobile, for users out and about during the festival. Features include being able to upvote other people’s tips, and order the list alphabetically and by most popular. My scrupulous attention to detail also came into play, as I pre-empted things that might bother me when other people started adding to the list! So entries are styled to be capitalised, as is the first word of the description. There is a maximum character limit and, whether a description is added or not, each entry is vertically centred in its row. For brand recognition — and because I like the style — the design was modelled on The Great Escape website.